Many wars were fought during the 20th century. 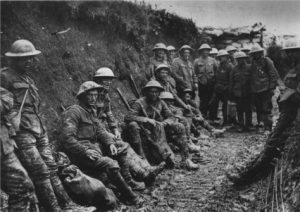 However, there are a couple of them that are thought to be bigger, or at least more famous than the others; World War 1 (First World War, WWI or WW1), which was fought from 1914 to 1918 and World War 2 (also known as Second World War, WW2 or WWII), which took place between 1939 and 1945. They both involved many of the most powerful armies in the world as well as alliances made between a lot of countries. WWI took place in Europe. It was a confrontation between two groups – the Allies versus the Central Powers. France, the United Kingdom, Italy, Japan and the Russian Empire constituted the Allies. The United States only became part of the Allies in 1817. As for the Central Powers, this group was constituted by Germany, Austria-Hungary, Bulgaria and the Ottoman Empire. WWII, on the other hand, was a confrontation between the Axis (Germany, Italy and Japan) and the Allies (France, Britain, the United States, the Soviet Union and China). This war is mostly remembered because of the genocide that the Jewish people suffered. The Nazis perpetrated this genocide. Dates WWI lasted for 4 years; from 1914, to 1918. WW2, on the other hand, lasted 6 whole years, from 1939 to 1945. Also known as… The war to end all wars, the great war, the Kaiser’s war, the European war, first world war. Second world war, world war two, the great patriotic war. What caused it? The main reason or excuse behind WWI was the murder of the Archduke Francis Ferdinand of Austria on June 1914. There was also a combination of nationalism, militarism and imperialism, that did not help either. 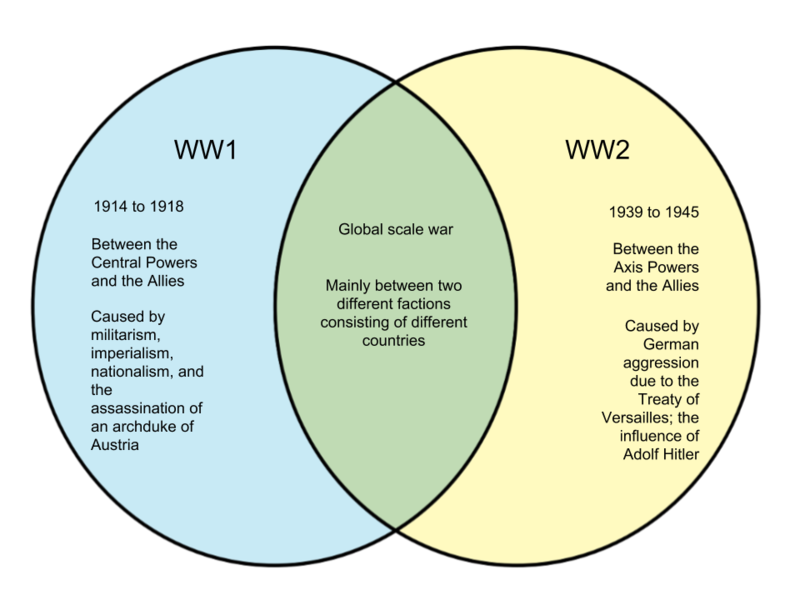 Germany was in such bad shape after WWI, mostly because of the jarring conditions of the Treaty of Versailles. This crisis and instability facilitated the rise of Adolf Hitler. Nature It was a war between countries. It was a war between ideologies. (Estimated) Over 10 million military deaths. (Estimated) Over 7 million civilian deaths. (Estimated) Over 21 million wounded. (Estimated) Around 7.7 million missing-imprisoned people. (Estimated) Over 60 million deaths, although some say there were over 80 million deaths. (Estimated) Between 38 and 55 million civilian deaths. Between 13 and 20 million deaths from diseases and famine. Was there genocide? Yes. The Ottoman Empire committed genocide against the Armenians. Yes. The Nazi Germans committed genocide against the Jewish people. Guns This war was fought from trenches. 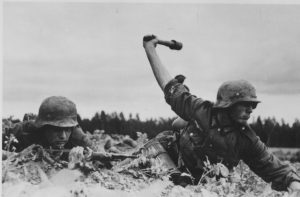 The war utilized a lot of artillery and machine guns, infantry assault, tanks, airplanes and poisonous gas. For the first time, nuclear missiles were used. There were also submarines and tanks. Results Russia, Germany Austro-Hungarian and Ottoman Empires were defeated. The last two stop from existing. The war finished with a victory from the Allies.